Are you facing water supply problem in your area? Want to bring it to the notice of municipal authorities to take an action ? 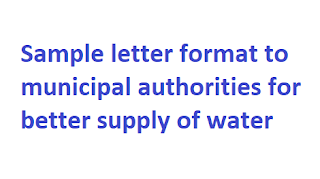 Then you may submit a request letter stating the water problem to the concerned authorities. 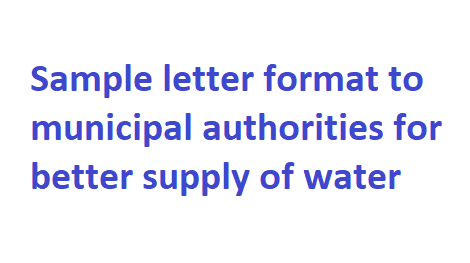 This article describes how to write a letter to municipal authorities for better supply of water. Without water, there is no world. As population increases, the demand for water is increased day by day. In a crowded area, there should be enough supply of water, otherwise the people will suffer a lot. If you want to bring a water problem to the concerned municipal authorities, then it is better to write a request letter to them so that the problem is expected to be overcome as soon as possible. I am residing the area Church Park Road where over 5000 people are living. We have limited supply of water and the supply is given once in 10 days. So it is very difficult for us to run a life here. Also the existing water tank are severely damaged so that a lot of water are wasted. We kindly request you to look into this matter very urgently and make us happy by regulating the water supply. Thanking you! Note: The contents provided above are for sample letter only. You are requested to make necessary changes in appropriate places to make the letter to suit to your situations.